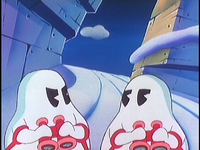 Flaky, along with his identical Flurry companion, using binoculars to spy on Mario, Luigi and Princess Toadstool. Flaky is a Flurry and minion of King Koopa from The Super Mario Bros. Super Show! episode "The Bird! The Bird!". As Mario, Luigi, and Princess Toadstool begin their trek up a mountain in search of Toad, who has been abducted by a Birdo, they are spied upon by Flaky and his unnamed Flurry companion. Deciding to inform King Koopa of their presence in the Land of Ice, Flaky and his companion go to King Koopa's ice palace. At the aforementioned ice palace, Flaky and his ally inform King Koopa of what they saw while heaping pleasantries at the Koopa ruler. Inexplicably ordered by King Koopa to lick his feet, Flaky and his companion proceed to do so. Much later, as King Koopa, believing Mario, Luigi, and Princess Toadstool to have been vanquished in an ambush by several Bob-omb wielding Albatosses, is rewarding said Albatosses with medals, he is informed by Flaky and another Flurry that Mario, Luigi, and Princess Toadstool survived the ambush. Flaky may possibly be among the Flurries that aid King Koopa and his Koopa Troopas in attacking Mario, Luigi, and Princess Toadstool; if this is true, Flaky is either blasted by Super Mario's fireballs or is hit by one of the Turnips thrown by Toad. This page was last edited on August 3, 2018, at 17:00.